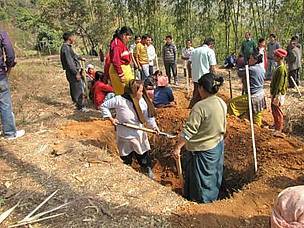 WWF-India’s Khangchendzonga Landscape (KCL) Programme has been awarded the prestigious ‘Ground Water Augmentation Award-2010’ by the Government of India for its work on springshed development in Sikkim, North East India. New Delhi: WWF-India’s Khangchendzonga Landscape (KCL) Programme has been awarded the prestigious ‘Ground Water Augmentation Award-2010’ by the Government of India for its work on springshed development in Sikkim, North East India. Landscape Coordinator of WWF-India’s KCL, Ms. Priyadarshinee Shreshta was today presented with 100,000 Rupees and a plaque with a citation, by the Union Cabinet Minister for Water Resources and Parliamentary Affairs, Mr. Pawan Kumar Bansal at the valedictory session of the ‘India Water Week and National Ground Water Congress’ being held this week in New Delhi. The award is given every year for innovative practices of ground water augmentation and WWF-India was nominated by the Government of Sikkim for support provided to the Dhara Vikash Programme of the government’s Rural Management and Development Department (RMDD). Nearly 80% of rural households in Sikkim depend on mountain springs as a source of drinking water, and these springs have been drying up over the years. Degradation in the catchment area from increased anthropogenic pressures has previously been identified as the primary cause for drying up of springs in the past; an emerging new threat is climate variability. Understanding the need for working for the revival of these springs, the Springshed Development or Dhara Vikas programme was conceptualised in 2008 by the RMDD in partnership with WWF-India and other NGOs to sustainably develop and rejuvenate the mountain springs in the state of Sikkim. The primary objective of the Dhara Vikas programme is to ensure that the surface runoff of rainwater in the springshed area is reduced and more water percolates down to recharge the underground aquifers, thus resulting in increased discharge of the springs. The programme was also conceived as a climate adaptation strategy for the villagers dependent on these springs. The actual implementation in the field was undertaken through the flagship programme of the Government of India, the Mahatma Gandhi National Rural Employment Guarantee Act or rural employment guarantee scheme. 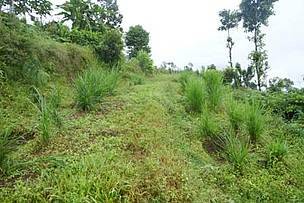 Eight drought prone areas in the South and West districts of Sikkim were initially selected for implementing the programme on a pilot scale. With technical support from the People’s Science Institute, Dehradun, WWF-India facilitated the training of master trainers consisting mainly of field facilitators, who would undertake the Dhara Vikash or springshed development programme in their own areas. The training included the use of GPS, identification of the catchment areas and measuring and monitoring the spring discharge. Exposure trips to the states of Uttarakhand and Himachal Pradesh, where similar ground water recharge initiatives had been undertaken were also organised. Based on the success of the pilots the Dhara Vikas programme is now being scaled up by the state government to include larger catchment areas that would benefit multiple downstream springs and streams simultaneously. WWF-India continues to support the State Government of Sikkim in independently monitoring the discharge data at the different spring sites. WWF also recognises the wonderful partnership between RMDD and SIRD, ACWADAM, PSI, and above all the local communities which made the Dhara Vikas Program such a great success.